Once again I was inspired by the weekly theme at the Bento Blog Network. 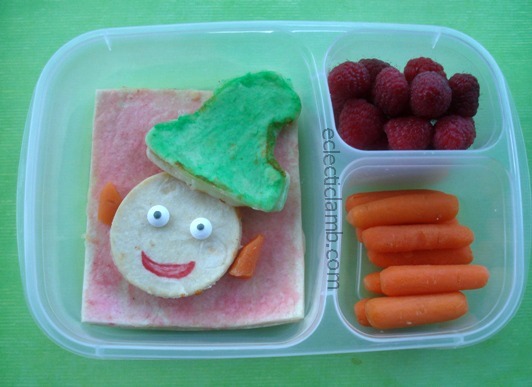 This Elf themed meal can be a lunch or snack depending on the needs of the person eating it. My 15 year old niece helped me make this silly elf. We used a circle cookie cutter for the head and a Santa hat cookie cutter for his hat. He is a quesadilla painted with food color and water. My niece used food safe markers to draw his mouth. This entry was posted in Bento / Cute Food, Food and tagged bento, holiday. Bookmark the permalink. I bet your niece had lots of fun making this!! Thank you! I can’t find your post. Please provide a link.